After a hard day’s training on Saturday Ka-Pow! 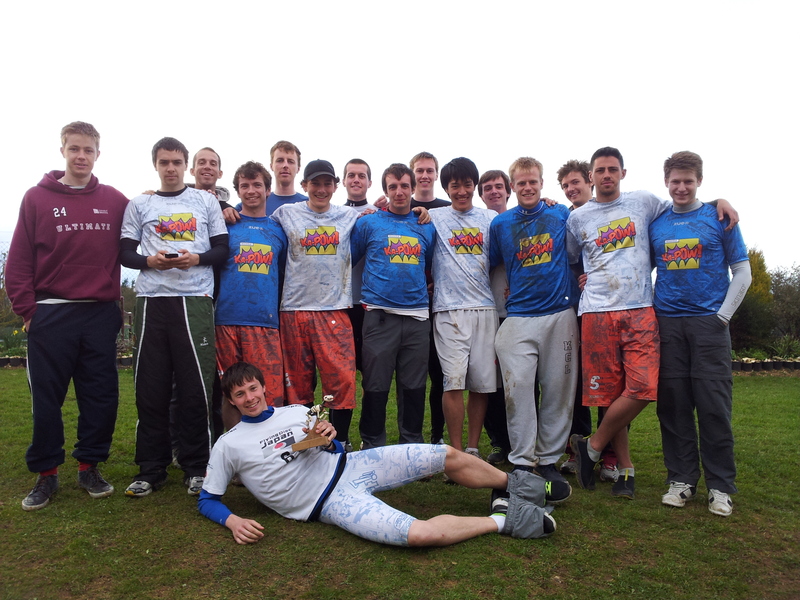 showed up to the DED warmup hoping to build on our unbeaten record at the tournament from the year before. Despite the absence of a few key players, the presence of gale force winds, and massive roster turnover from last year, we were quietly confident of retaining our crown. First game was against London rivals Tooting Tigers. We started strongly by converting an upwind break, and never looked back. Big pulls from Dave Tyler, consistent upwind handling from Sion, and a number of huge grabs by Tim put this game to rest fairly early on. Tooting’s small squad couldn’t keep up with our bigger numbers and we came out on top despite some long points. Next up was another local rival, Burro. They had a lot of new faces but played a familiar Burro game, looking to beat us on the break side. We did a great job stopping their arounds and forcing them to throw difficult inside-outs. A few upwind breaks including an incredible layout grab by Elias (of course assisted by a hammer from Sion) brought us safely to the finish line. Lots of turns in this one, but we were able to grind out most of our points with some stifling defensive play. Our next game was against DED, the hosts, and the only other team with numbers close to ours. We knew this would be the toughest game of the day, particularly as DED didn’t have too much roster turnover this year and therefore had some good chemistry. With DT and Elias gone and Will somewhat injured on the sideline, we turned to a very successful split-stack offense, which managed to get us a few upwinders. Despite conceding our first upwind point of the day, we were able to hold off a late comeback to win by a fairly comfortable five goal margin. We agreed to play a shortened game with Cambridge and once again came out firing on all cylinders. We took half convincingly and despite having some great players Cambridge just didn’t have the roster depth to keep up in the last game of a long day. We kept up the intensity despite (I think) having already won the trophy, and closed the game out without conceding an upwinder. Play of the game for this one went to Jonny with a huge layout catch d which we converted for an upwind score. A great day overall. After a few months of training in single-digit temperatures it was great to go out and see the results on an undefeated day. Both our man and zone defense looks were looking strong, and some good , patient upwind offense allowed us to develop a bit of chemistry. Hopefully we’ll be able to carry this momentum into Fog Lane Cup and the tour season! The unfortunate result of four wins on the day was that we had to (for the second time running) return to London with the world’s ugliest trophy. Luckily, Kyle volunteered to take it home before having seen it.